Asia is the largest, most populated continent on Earth and contains within its over 17 million square miles (44.5 million square kilometers) 49 countries that together are home to about 60% of the world population. From the northernmost reaches of Russia’s Siberia to the thousands of tropical islands making up Indonesia, the vast Arabian Desert spanning much of Saudi Arabia to the heavily forested, mountainous archipelago of Japan—Asia is incredibly rich and diverse when it comes to geography, climate, economy, politics, people groups, and, of course, cuisines. With that in mind, to create a detailed guide to Asian cuisine that not only feels all encompassing, relevant, and practical, but also helpful and natural, would be incredibly difficult. How could we possibly hope to capture the shadows of subtlety dappled in the seasonal cooking of Japan while also paying rightful homage to the bold spices and rich fragrances of Turkish dishes? If we dove into the extremely regional cuisines of China, for example, zeroed in on influential Cantonese cuisine, then swooped Westward to consider the piquant fare of the Sichuan province—would you keep up or simply keep on scrolling? Basically, what we’re really saying is that we can’t possibly cover all the nuances of the vastly different cuisines that make up Asian cuisine—so instead, we’ve grouped the geographical regions of Asia by similarities in flavors and ingredients to give an overview that explores the surface of Asian cuisines, with more detailed pit stops in select countries. So, grab your passport (or maybe just a snack, you’ll want one), and join us on a delicious journey through Asia! Okay, so it’s not exactly edible, but you get the picture. 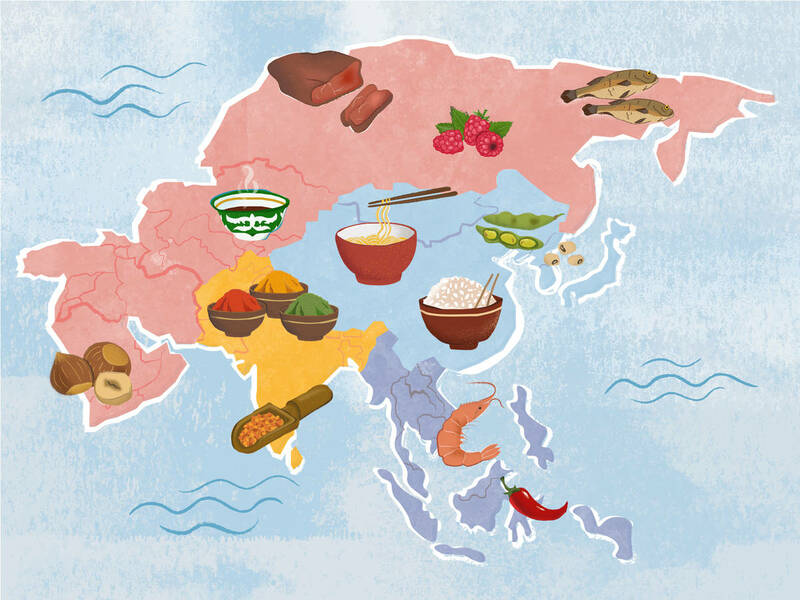 Below we’ve covered the six geographical regions of Asia, highlighting the shared staple ingredients of each region for a quick visual overview with a deeper dive into the cuisines of selected countries. A little disclaimer: Right or wrong, so many of us tend to think only of East, Southeast, and sometimes South Asia (the Indian subcontinent) as “Asia” so (as you’re soon to see) we’ve spent more time highlighting the dishes, ingredients, and techniques of the countries within those three regions. The common staple ingredients shared across most of the countries in East Asia (China, Hong Kong, Japan, Macau, Mongolia, North Korea, South Korea, and Taiwan) are, broadly speaking: rice, soybeans (most commonly in the form of soy sauces or pastes), seafood, chicken, and noodles. Through these shared staple ingredients, the dishes, flavors, techniques, and presentations vary widely, as the cuisines of China, Japan, and Korea will serve to illustrate. Although there are many regional cuisines within China that are known to vary from village to village, family recipe to family recipe, four (or sometimes eight) great culinary traditions are usually lifted out among the rest—an easy way for foreigners to try and get a handle on this complex food culture. With centuries of history being influenced not only by the huge range of geography and climate across China, but also by the many cultures and people groups that have moved and lived within, here are the main ingredients and dishes of the four major cuisines of China. Cantonese, Guangdong, or Yue cuisine—South China: Commonly flavored by garlic, ginger, and scallion with some combination of hoisin, plum, black bean, or oyster sauce, the dishes of Cantonese cuisine (or some version of them) are highly likely to be familiar to you even if you grew up in the West (it was, after all, the first Chinese cuisine to become popular in the US). Some of the traditional dishes include sweet and sour pork, char siu, chow fun, salt and pepper shrimp, soy sauce chicken, shark fin soup, and last but not least, the much-loved tradition of dim sum. Huaiyang cuisine—East China: Known for elegant dishes that rely on intricate knife skills and many types of dumplings, Huaiyang cuisine is almost always a bit sweet, never spicy, and focuses on preserving the original colors of ingredients for an all-around appealing tableside presentation and taste. The Huai river and city of Yangzhou are the namesake for this cuisine and serve to explain why the dishes are so often seen as quite luxurious and opulent—Yangzhou was a major trading center and one of the wealthiest cities through much of China’s history. A key ingredient in many dishes is Chinkiang (Zhenjiang) vinegar, a black rice vinegar with a unique smoky flavor and deep color. Traditional dishes hailing from this cuisine are pot stickers, Yangzhou fried rice, baozi (or bao), and steamed dumplings. Shandong or Lu cuisine—North China: Often thought of as one of the most influential in all of Chinese cuisine, Shandong cuisine is known for a proficient use of various cooking methods and ingredients. Along with a heavy use of seafood, this cuisine also makes use of regionally grown maize, peanuts, grains such as barley and millet, onions, and vinegar. They also use honey and sugar to caramelize and form a delicate crystal crust on various fruits. Known most for their braised sea cucumber dishes, they are also known for their braised prawns, braised intestines, and milk soup. Sichuan (Szechuan) cuisine—West China: Known for their liberal use of garlic, fermented bean paste (doubanjiang), various chilis, peanuts, and, of course, their namesake Sichuan peppercorns, Sichuan cuisine combines these bold flavors to create an array of dishes that span the spectrum when it comes to spice. The seven basic flavors that find balance in the classic Sichuan dishes (mapo tofu, schuizu fish, Sichuan hotpot, and kung pao chicken, among others) are sour, pungent, hot, sweet, bitter, aromatic, and salty—so try one out for yourself and see how various ingredients and flavors stack up in Sichuan cuisine. The relatively recent global gastronomic movement towards the celebration of all things seasonal is merely following in the footsteps of traditional Japanese cuisine, where the seasonality of food plays an important, if not the most important, role. The peak season of various ingredients—from the expected, like tender bamboo shoots, cucumbers, chestnuts, and sweet potatoes, to the unexpected, like fish and staple grains—is referred to as shun, which are often waited for in earnest. This anticipation of and for the particular flavors and textures of Japan’s highly seasonal, natural, and often local ingredients goes hand-in-hand with the balanced flavors that often embody aspects making them both simple and complex, gentle and pronounced, basic and sophisticated. Ingredients like soy sauce, miso, dashi, sake, and mirin are common, and traditional dishes include tempura (of vegetables or seafood), rice bowls like gyudon and oyakodon, sushi, udon, miso soup, and pickled or salted vegetables called tsukemono that accompany many of the rice-based meals all around Japan. In addition to the quality or seasonal ingredients, there are five principles of traditional Japanese cuisine that are commonly used to keep balance in individual dishes, multi-course meals (like kaiseki), and Japanese bento. These principles are: variety in color for visual stimulation, texture for sensory stimulation, nutritional values, cooking style or technique, and variety in taste (salty, sweet, sour, bitter, savory). Try one of our Japanese recipes and see for yourself how these principles play out in real life. A typical Korean meal is made up of rice, vegetables, and meat and served with various side dishes (banchan) like different fermented vegetables (kimchi), pan-fried or pancake-like dishes, or lightly seasoned steamed, stir-fried, or marinated vegetables. Having upwards of 15 different kinds of banchan at one meal is not abnormal, and most meals are eaten family-style—with individual bowls of rice for each person, and sharing dishes dotting the rest of the table. The most common seasoning ingredients include toasted and untoasted sesame oil, soy sauce, garlic, ginger, fermented bean paste (mostly doenjang made from soybeans), and gochujang—a fermented red chili paste. As opposed to Japanese cuisine, Korean cuisine is very savory, intensely flavored, and incredibly bold, which can be tasted in the classic Korean dishes like beef bulgogi, bibimbap, kimchi, and the recently popularized Korean fried chicken. The common staple ingredients shared across most of the countries in Southeast Asia (Brunei, Cambodia, East Timor, Indonesia, Laos, Malaysia, Myanmar, Philippines, Singapore, Thailand, and Vietnam) are, broadly speaking: vinegar, shrimp pastes, rice, fish sauce, chilis, and fresh herbs. From the vinegar-loving Philippines to the elemental balance of philosophical importance in Vietnamese cuisine, let’s make our way through the pitstops of Southeast Asia! Many of the cuisines featured in the context of this article are, when you dive deeper, really studies in the way cultures learn, take, and react to each other. Nowhere is that more prevalent than in the food of the Philippines. With over 140 different and distinct groups with their own traditions and culinary culture found in the Philippines, even without outside influence this cuisine would be extremely difficult to categorize. Add in the impressions from Malaysia, Indonesia, China, Spain, and America, and it’s easy to see how the vast range of Filipino dishes—from lechón (whole roasted pig brought to the Philippines during the Spain’s colonization of the country) to lumpia (fresh or fried spring rolls brought by Chinese immigrants), Filipino food is quirky, idiosyncratic, and notorious for its reputation as the original (whispers) fusion cuisine. Centered around the idea of using each dish as a counterpoint for another to equalize sweet, sour, and salty flavor profiles, Filipino cuisine commonly features vinegar (of different kinds, but mostly palm vinegar), as well as rice, coconut milk, calamansi (a hybrid citrus fruit cultivated in the Philippines), and, more often than not, pork. The most commonly known Filipino dish is adobo, which involves marinating and braising meat, seafood, or vegetables in vinegar, soy sauce, garlic, and black peppercorns. Usually served with white rice and, if you’re in the Philippines, simply a fork and spoon. An aromatic harmony of sweet, sour, salty, bitter, and spicy, in Thailand food is an important aspect of the everyday. So much so in fact, that in lieu of a “What’s up?” many Thais ask each other “Have you eaten yet?” any time they meet. Most Thai dishes have a spicy edge mellowed by the salty bite of fish sauce and a fragrant shower of fresh herbs. Popular the world over, dishes like tom yum soup, pad Thai, green papaya salad, Thai green curry, and larb showcase the fresh flavors of Thai cuisine and often feature some of the most common Thai ingredients: garlic, galangal, lemongrass, shrimp paste, fish sauce, chilis, sticky rice or rice noodles, and a variety of meats from beef to shellfish, duck to pork. Similar to Thai cuisine, Vietnamese cuisine relies heavily on fresh flavors. The cuisine also puts a focus on combining a variety of different colors and textures in an effort to balance five elements associated with nutrition, the body, and the senses: metal (white, spicy, smell, minerals), earth (yellow, sweet, touch, protein), water (black, salty, sound, water), fire (red, bitter, taste, fat), and wood (green, sour, visual, carbohydrates). While it might be a bit abstract and difficult to think of how this plays out in a dish, next time you’re cooking or eating a Vietnamese meal, think of the flavors and ingredients and try to categorize the various elements. Base ingredients often used in Vietnam span the gamut from lemongrass, ginger, and fish sauce to fresh Thai basil, mint, and lime. An overall healthy cuisine, Vietnamese dishes use very little oil or dairy, instead relying on the abundance of herbs and vegetables in addition to a variety of proteins and bases like bread, rice, and rice noodles. Dishes like com tam (a broken rice plate generally topped with grilled pork, a sweet and sour fish sauce, pickled vegetables or greens, and an egg), pho (a rich, brothy soup served with various meats, soy sprouts, fresh herbs, and chilis), and banh mi (a baguette sandwich filled with pate, cold cuts, pickled vegetables, cucumber, and jalapeños) are well-known outside of Vietnam, especially in places with large Vietnamese communities. South Asia (Afghanistan, Bangladesh, Bhutan, India, Maldives, Nepal, Pakistan, and Sri Lanka) is a little bit different than the other regions of Asia. The region of South Asia refers to the entire Indian subcontinent, and Indian cuisine actually encompasses the cuisines of each country on the subcontinent. While there are of course different influences, ingredients, meal structures, etc. that distinguish Nepalese and Pakistani, Sri Lankan and Afghan cuisines, broadly speaking, ghee, chilis, assorted spices, lentils, and chickpeas are found across the cuisines that make up Indian cuisine. Beef and pork are uncommon proteins, leaving chicken, lamb, goat, and fish as the most common meats for all kinds of curries, biryanis, and flatbread fillings. Below, we’ll delve deeper into the cuisine of the country of India itself as a jumping off point for those interested in exploring more about the cuisines of this region. With numerous regional cuisines that differ based on geographical surroundings and economic status, to sum up Indian cuisine is, as with many countries in Asia, incredibly difficult. What many dishes start with though, are spices. Chili pepper, black mustard seeds, cumin, cardamom, turmeric, coriander, ginger, fenugreek, and bay and curry leaves are common throughout the country, giving their flavors to curries, masalas, biryanis, rotis, dals—just about every dish in the Indian kitchen. Other ingredients common to the dishes in India are millet, pigeon peas, mung beans, ghee (clarified butter), and many different varieties of rice. India is also home to many people who follow specific, restricted diets based on their faith. The jain faith, for example, follows a very strict vegetarian diet, and Hindu scripture forbids beef—as the slaughter of cows is condemned. To experiment at home with Indian cuisine, start with a well-stocked spice rack and these recipes! The common staple ingredients shared across most of the countries in North Asia (Russia’s Siberia) are, generally, reindeer, fish, and berries, whereas in Central Asia (Kazakhstan, Kyrgyzstan, Tajikistan, Turkmenistan, and Uzbekistan) the common ingredients are dairy products, horse, mutton, and tea. In West Asia, also known as the Middle-East (Armenia, Azerbaijan, Bahrain, Cyprus [and Northern Cyprus], Egypt, Georgia, Iran, Iraq, Israel, Jordan, Kuwait, Lebanon, Oman, Palestine, Qatar, Saudi Arabia, Syria, Turkey, United Arab Emirates, and Yemen) the shared ingredients are typically nuts, spices, cheese, bread, lamb, and beef. To learn more about these cuisines, try some of the recipes below, or share your favorites in the comments! As different as the cuisines of Asia are, they have one thing in common: Dumplings. With distinct shapes, fillings, doughs, and techniques, each region has their own—keeping only to the form of a comforting steamed, deep-, or pan-fried pouch of deliciousness. From North Asia’s pelmeni to South Asia’s samosa, we'll leave you with these: The dumplings of Asia.